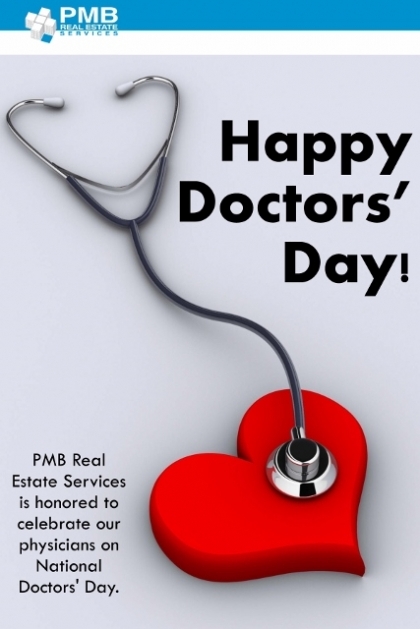 PMB Real Estate Services is honored to celebrate our physicians on National Doctors' Day. Thank you for all you do in sharing your skill and expertise, your care and compassion and for making a difference each and every day! The first Doctors' Day was observed on March 30, 1933 in Winder, Georgia. The wife of Dr. Charles B. Almond, Eudora Brown Almond, decided to set aside a day to honor physicians. In honor of those physicians, greeting cards were mailed and flowers places on the graves of deceased doctors. The red carnation is used as the symbolic flower for National Doctors' Day. Following overwhelming approval by the United States Senate and the House of Representatives, on October 30, 1990, President George H.W. Bush designated March 30th as "National Doctors' Day."